A new year has arrived! For cryptocurrency investors, that means hope for another year of growth in virtual currency markets. Unfortunately, however, it also means we need to get ready to pay taxes on our cryptocurrency profits from 2017. Most of us have made our resolutions and decided on our aspirations for 2018, but few of us are looking forward to filing our tax returns. But being prepared is half the battle, so now is the time to begin tax planning. It’s always a good idea to consult with a Certified Public Accountant (“CPA”) when you’re preparing your tax returns. A good CPA can help you avoid tax liability by managing your assets in a smart way. However, your regular accountant probably isn’t up to speed on the evolving landscape of cryptocurrency tax policies. If you’ve invested in Bitcoin or other virtual currencies, contact a trained cryptocurrency accountant to make sure you’re prepared for tax season. Cryptocurrencies may have started off on the fringes of the internet, but now it’s a pretty mainstream investment. Bitcoin futures are traded on the Chicago exchanges, and large institutional investors are setting up virtual currency trading desks. As cryptocurrency has become more and more popular, the Internal Revenue Service (“IRS”) has refined the details of its policies regarding tax collection and reporting requirements. The IRS treats Bitcoin and other virtual currencies as capital assets because they are convertible into cash. So, like other capital assets, cryptocurrencies are subject to the capital gains rules. These rules apply to taxpayers who buy and sell cryptocurrencies for investment purposes, as well as people who spend virtual currencies on goods and services. Just like other capital assets, your tax rate depends on how long you held them before you sold them, as well as the price you bought in and the price you sold out. If your capital losses on your cryptocurrency investments exceed your capital gains, you can claim the loss as a deduction on your income tax returns up to $3,000. When you’re figuring out how to properly report your cryptocurrency gains on your 2018 income tax return, start by finding out your cost basis. Your basis is the cost you actually paid for a virtual currency when you purchased it, adjusted for any related costs. This means you can deduct commissions related to the cryptocurrency purchase, such as the percentage that Coinbase takes out of every exchange. Notably, however the cost basis for your cryptocurrency investments does not include investment-related fees. Fees accrued for cryptocurrency trades in 2017 must be listed separately on a Schedule A form attached to your returns, assuming you itemize your deductions. When you purchase a cryptocurrency, you’ve established your cost basis. However, the asset is not actually taxed until you sell it. This is when you “realize” your gains or losses on the investment. So, if you bought Bitcoin at $12,000 and sell it for $13,000, your realized gain is $1,000 even if it dips below your initial purchase price at some time in between. Sounds simple enough, right? Unfortunately not. Unlike stocks, which are straightforward buy-and-sell transactions, pretty much any disposition of virtual currency assets is a taxable event. Tax liability is triggered when you trade your cryptocurrency for cash or other virtual currencies or whenever it’s used to purchase goods or services. Depending on your investment and spending habits, this can make things complicated. Contrary to the popular belief – and wishful thinking – of many cryptocurrency investors, cashing out of your cryptocurrency investments isn’t the only taxable event in the lifespan of your investment. For example, if you make a purchase using Bitcoin on Overstock.com, this is a transaction subject to capital gains tax. Tax liability also arises when you trade one virtual currency for another, which is an almost daily occurrence among the more courageous cryptocurrency investors. Also, because the IRS doesn’t impose the same third-party reporting requirements for virtual currencies as other more highly-regulated assets, you won’t get a Form 1099 from your exchange, client, or employer at the end of the year. This means you won’t get an official report of your cryptocurrency income. Rather, it’s your responsibility as the investor’s to properly report your virtual currency gains and losses. There is very little official guidance from the IRS on virtual currency reporting requirements, so consulting with a trained cryptocurrency accountant this tax season is a very wise choice. If you ask any accountant about the impacts of the 2018 tax reforms, you will likely get an exasperated sigh in response. Cryptocurrency tax policy is pretty vague as is, and adding the complexities of major tax reform only makes things even more complicated. While the full impact of the federal tax reform remains to be seen, there are a few policies that definitely impact virtual currency investors. The recent federal tax reform changed the rules of the game for many cryptocurrency investors. For example, starting in 2018, you can no longer include cryptocurrency-related fees in your itemized deductions on your personal income tax return. This deduction is still allowed for businesses, however. The 2018 tax reforms also change the capital gains tax rates, which may greatly impact your investment decisions. Holding on to your cryptocurrency assets for another few months may save you – or cost you – thousands of dollars on your federal income tax returns. A skilled cryptocurrency accountant can help you plan for the upcoming changes in the federal tax code, especially as they pertain to your virtual currency wallet. If you bought or sold cryptocurrencies in 2017 – or if you’ve thus far failed to report your cryptocurrency investments from prior rules – it’s a good idea to discuss your investments with a CPA that understands the ins-and-outs of cryptocurrency tax policies. Mario Costanz is a lifelong entrepreneur and has had built and sold a number of successful businesses in the internet, restaurant, real estate, and income tax preparation industry. He was named to the “One to Watch” section of Accounting Today’s 2017 Top 100 Most Influential in Accounting List. More information and contact can be found at https://CryptoTaxPrep.com and https://linkedin.com/in/mariocostanz. Did you know you can buy a Miami house or condo with Bitcoin, Ethereum, Ripple, Bitcoin Cash, Dash or any combination of cryptocurrencies – and it’s not as hard as you might think. You just need one thing: For the buyer and seller to agree on exchanging digital currency for the property. And if one party would rather receive or give regular dollars, no problem, there are plenty of licensed digital exchanges that just do that. Miami Penthouse accepts Cryptocurrency offer. The very first cryptocurrency only real estate transaction took place in Miami in December of 2017, when 17.741 Bitcoin, or the equivalent of $275,000, for a two-bedroom unit at 777 Northeast 62nd Street in Miami’s Upper East Side neighborhood, exchanged owners. making it the most expensive cryptocurrency Bitcoin-to-Bitcoin real estate deal to date in the country. And it took Komaransky only 6 months to find a crypto-buyer for his Miami Beach luxury home. A cryptocurrency is a digital asset designed to work as a medium of exchange that uses cryptography to secure its transactions, to control the creation of additional units, and to verify the transfer of assets. Cryptocurrencies are a type of digital currencies, alternative currencies and virtual currencies. Cryptocurrencies use decentralized control as opposed to centralized electronic money and central banking systems. The decentralized control of each cryptocurrency works through a blockchain, which is a public transaction database, functioning as a distributed ledger. Bitcoin, created in 2009, was the first decentralized cryptocurrency. Since then, numerous other cryptocurrencies have been created. Brosda & Bentley Realtors is the first Miami real estate brokerage utilizing ShelterZoom’s Offer NOW, a blockchain-based, real estate online offer/acceptance solution, spanning over 15 countries. On Brosda & Bentley‘s website, buyers and sellers of real estate find the industry’s first cryptocurrency payment option for mass adoption. 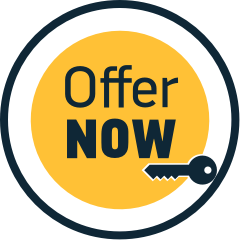 Offer NOW, is a pioneer solution that significantly refines and streamlines the process of making and accepting real estate offers online maybe revolutionizing how real estate is sold and acquired in the future. The Offer NOW widget, which enables buyers and buyer agents to instantly submit offers through ShelterZoom-affiliated websites, is already extremely popular. The solution includes a powerful dashboard, the Offer NOW widget and a mobile app. Since the end of last year, many buyers and sellers are contacting Brosda & Bentley Realtors wishing to either acquire or sell Miami homes in cryptocurrency transactions. Katerina Brosda, the principal broker is a cryptocurrency investor and therefore cryptocurrency savvy, able to bring buyers and sellers of the same mindset together to transact in digital currencies. Now Brosda & Bentley is offering this custom designed 2-story Miami penthouse with spectacular 180° unobstructed views from Ft. Lauderdale to South Beach & Downtown Miami. This breathtaking home has 20′ ceilings in the living room, wraparound balconies (72′ long) on the 24 and 25 floors and a media room. Marble top Chef’s kitchen, amazing sunken bathtub with panoramic views of Biscayne Bay & the ocean. This gorgeous penthouse home fits perfectly with an active and social lifestyle. ‘Have a party, play the grand piano, enjoy the real fireplace & the billiard room’, Brosda said. ‘One other amazing feature of this home is the unlimited storage area; it has built-in custom real wood closets installed throughout the home, which is rare to find. Bring your boat! A 50′ boat slip is included in the sale’. Miami real estate buyers can make a cryptocurrency offer through Offer Now, on the landing page of Brosda & Bentley’s website.